The Dettlaff family has been in the game for 110 years, ever since the author’s father Hank became a caddie at the age of nine in Oshkosh, Wisconsin in 1907. He turned professional in 1921, and over the next 35-years served the residents of Oshkosh as a noted professional - teaching, playing competitively on the early PGA Tour, greenkeeping and even designing a few local golf courses. The author graduated from the University of Wisconsin Oshkosh in 1973 majoring in Journalism. He pursued a career with a suburban Chicago newspaper chain as a photographer rising to Managing Editor. In late 1978 the draw to follow in his father’s footsteps took him to South Florida and Inverrary Country Club where he earned PGA Membership in 1981. In 1988 he attained the PGA’s highest status as Master Professional #57. Billy spent 22 years with the PGA Tour’s TPC Network as a Director of Golf / General Manager, Regional Director of Operations, and as the network’s first National Director of Golf based at TPC Sawgrass. In 2007 for the PGA Tour he wrote his first book, A Storyteller’s Guide – THE PLAYERS Championship and TPC Sawgrass. Since his retirement in 2009 he has worked full-time expanding his Master Professional thesis on the history of the golf profession into a detailed study on the subject. Nearly seven years of research has delivered a 1500 page / 450,000 word paper on the subject. In 2015 the PGA of America chose to use a greatly condensed version of his writings for their 208-page release, The Official Centennial Commemorative Book – The History of the Golf Professional. Dettlaff resides in Ponte Vedra Beach, Florida with his wife Geraldine. Together they have four children and six grandchildren. His stepdaughter Debbie Foley is a PGA Certified Professional and their son Hank is a PGA Apprentice Professional. 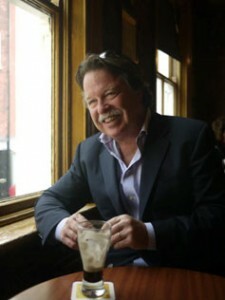 John Steinbreder is an award-winning journalist and the author of 19 books, including Club Life, Golf Kohler, From Turnberry to Tasmania, The 3-Degree Putting Solution (with Michael Breed), Golf Rules and Etiquette for Dummies, 18 Ways to Play a Better 18 Holes and Golf Courses of the U.S. Open. A senior writer for Global Golf Post, he also contributes to Masters.com, the official Masters website. Previously, Steinbreder worked as a reporter for Fortune magazine, a writer/reporter for Sports Illustrated and a senior writer for Golfweek. He has also produced articles for several prominent periodicals, including The New York Times Magazine, Departures, Forbes Life, the Wall Street Journal, Time and The Weekly Standard. In addition, he has composed chapters for a number of books, among them The Sports Illustrated Almanac, 1001 Golf Holes to Play Before You Die, A Walk in the Park and The Final Four of Everything. An avid golfer who carries a USGA index of six, Steinbreder has reported on the game on five continents and received ten honors for his work from the Golf Writers Association of America, and 17 from the International Network of Golf. He lives in Redding, Connecticut with his wife Cynthia and their daughters Exa and Lydia. Rob is a professional creative who studied at Flagler College in St. Augustine, FL. He specializes in graphic design, illustration, photography services, and fine art, serving clients across the country. Outside of creative endeavors he enjoys spending time with his family, outdoor activities, cooking and movies. I thought I knew all there was to know about golf professionals. But then I read Doctors of the Game by PGA Master Professional Billy Dettlaff, and that made me realize how uninitiated I really was on the subject. To be sure, I appreciated how the royal and ancient game had been played since the mid- 1400s in southeast Scotland and I was aware that Allan Robertson, the renowned ballmaker and player worked out of a small cottage by the Old Course in the early 1800s. But I had no idea that Robertson was regarded as the sport’s first golf professional. Or that he had hired a young boy named Thomas Mitchell Morris to work for him as an apprentice for several years, and that lad would come to be dubbed “Old Tom” Morris – and be regarded not only as the first assistant golf professional but also in later years one of the finest players, course superintendents, equipment makers and architects the game would ever produce. Those were just some of the early discoveries I made as I devoured Dettlaff’s opus, and I found it difficult to put down, as there seemed to be surprises on every page. The son of an early PGA professional, the author was a former photojournalist and managing editor of a suburban Chicago newspaper chain before becoming a golf professional himself and eventually spending 22 years with the TPC network, serving as general manager, Regional Director of Operations, and the network’s first National Director of Golf, based at TPC Sawgrass. He leads readers on a delightful journey, which begins during the early days of golf in the Old World, in the 15th century, and then flows into its evolution as a serious sport in Scotland in the 1800s. There are tales along the way of the artisan ball and clubmakers and the remarkable equipment they created, as well as stories of the great money matches that were contested on various links courses by the ‘crack’ players of the day. In addition to Robertson and Morris of St. Andrews, these top competitors included Musselburgh’s Willie and Jamie Dunn and youthful Willie Park, plus the colorful caddies who carried their clubs. Dettlaff also relates how and why the Open Championship was first established at the Prestwick Golf Club in western Scotland where Old Tom had moved to design that course and raise his family, and the ways that the business of playing golf for a living grew from there, in large part to the stellar play and early success of his son, Young Tom Morris. From there, Dettlaff describes the so-called American Transformation, as great immigrant professionals such as Willie Davis, Willie Dunn Junior, and Willie Campbell and his wife Georgina immigrated to Canada and the United States to take jobs at nascent clubs and began spreading the gospel of golf throughout the New World. 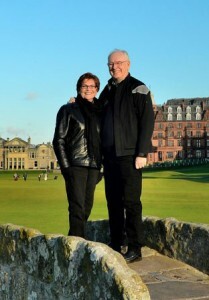 They were quickly joined by other Scottish golf professionals like Robert White, Fred McLeod and Chay Burgess, and occasionally by entire families, including the Foulis, Anderson, Smith, and Maiden brothers among them. 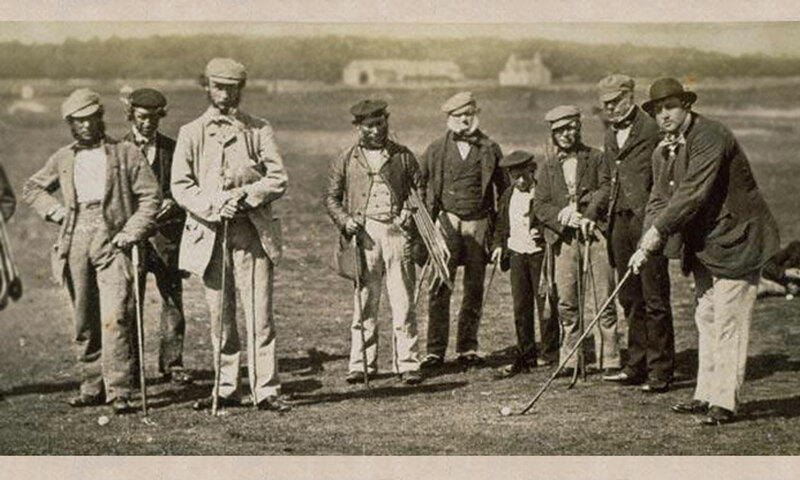 Collectively, those men educated a nation as to how to play the game – and played by the rules that were promulgated by the first golf societies in Scotland. They also taught Americans the intricacies of designing, building and maintaining golf courses. And as the first wave of immigrant professionals settled in into head and assistant professional positions at clubs and courses throughout the United States, others from the old country, such as Alex Findley, Tom Bendelow and Donald Ross, joined them to advance American golf course design. Thanks to the influx of these passionate and experienced architects, golf truly took hold in America at the turn of the 20th century. It was then up to the homebred professionals to take the game to the next level, and they surely did. Among those at the forefront of that movement was John Shippen, the African-American golfer who was the first American born player to compete in the U.S. Open, in 1896 at the Shinnecock Hills Golf Club on Long Island, where he was also serving as an assistant professional. Another was John “JJ” McDermott, the fiery Philadelphian who, at 19 years of age, became the first native-born American to win the U.S. Open - in 1911. He then won it again the following year. An equally important member of that group was Tom McNamara, who is credited with conceiving the idea to form an association of golf professionals and then helping found it in 1916. With the invaluable support of department store magnate Rodman Wanamaker, this association became the PGA of America. Once Dettlaff takes us to that point in the history of the golf professional, he leads us to the present time with generation-by-generation tales of the PGA, WPGA, and LPGA, and the men and women who were a part of those organizations and their growth. We get to know the immigrant pros that were there at the birthing of the PGA organization, and we learn how they and their American counterparts both served and survived World War I, the Great Depression and then World War II as they also continued to work hard to grow the game of golf. We get to know notable professionals like Long Jim Barnes and George Jacobus, and see how touring pros like Byron Nelson, Gene Sarazen and Ben Hogan served members at individual golf and country clubs when they were not competing in tournaments. Dettlaff tells us about the great Joe Jemsek from Chicago, who could well be described as the Father of Modern Public Golf in America, and Bill “Coach” Strausbaugh, who so selflessly mentored fellow PGA professionals that the Association named an annual award after him. We meet Brendan Walsh, Ken Morton and the Bob Nye family, Sandy Lumpkin LaBauve and Suzy Whaley, too. And when we are finished with Dettlaff’s tome, we cannot help but appreciate and understand what the golf professional is truly all about, and what the men and women who have held this title over the past 175 years have meant to the game and the people who play it. Each and every one of today’s men and women golf professionals share a remarkable legacy with founding professionals Allan Robertson and Old Tom Morris of St. Andrews, and Musselburgh’s Willie Park and the Dunn brothers - Willie and Jamie. Billy Dettlaff has written an important book, a fascinating book, and one that should be in every golfer’s library.